Survivor is an American rock band formed in Chicago in 1978. 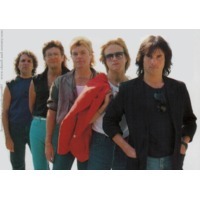 The band achieved its greatest success in the 1980s with its AOR sound, which garnered many charting singles, especially in the United States. The band is best known for its double platinum-certified 1982 hit "Eye of the Tiger", the theme song for the motion picture Rocky III (US #1 for 6 weeks). Singles like "Burning Heart" (US #2), "The Search Is Over" (US #4), "High on You" (US #8) and "I Can't Hold Back" (US #13) continued to chart in the mid-1980s. The band tweaked its musical direction in 1988 with the release of the slightly heavier Too Hot to Sleep, but the album barely reached the Billboard 200 in the United States. Because of this, the band split. Singer Jimi Jamison later toured as 'Survivor' in the mid-1990s, to the chagrin of the rest of the band. Jamison re-united with the band's other members in 2000 and the band released Reach in 2006, but Jamison left the band after its release and was replaced by Robin McAuley. The band has continued to tour with McAuley into 2010.